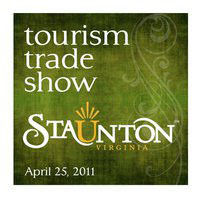 The first Staunton Tourism Tradeshow is set for Monday, April 25 from 10 a.m. to 7 p.m. at the Stonewall Jackson Hotel in Downtown Staunton. More than 25 exhibitors – including our sister magazine, New Dominion Tourist – will be on hand to showcase what the Valley has to offer locals and tourists alike. Find out what’s in your own backyard and enter to win prizes including an Apple iPad, $100 vouchers from the Shenandoah Valley Regional Airport, a Pandora bracelet from Sunspots and much more.